Depressive rumination is an emotion regulation strategy that is considered a major risk factor for depression and other emotional disorders. While well-established measures of trait rumination are available, a psychometrically sound measure of state rumination is lacking. We report on the development and validation of a new self-report measure, the Brief State Rumination Inventory (BSRI), in both Dutch and English. In Study 1, we report the results of a multi-group confirmatory factor analysis across three independent samples (n = 155; n = 141; n = 199). The analysis supported the unidimensionality and measurement invariance of the 8-item BSRI. We also examined its construct validity, showing that scores on the BSRI were positively related to measures of negative affect, trait rumination, and symptoms of depression and anxiety. 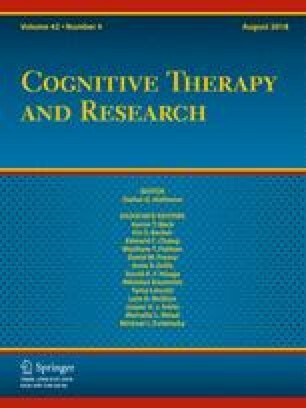 Scores were negatively related to adaptive emotion regulation strategies and to positive affect. In Study 2 (n = 60), we demonstrated the measure’s sensitivity to an experimental manipulation of rumination. Taken together, these findings suggest that the BSRI is a quick-to-administer, valid, and reliable measure of state rumination. The online version of this article ( https://doi.org/10.1007/s10608-018-9901-1) contains supplementary material, which is available to authorized users. This research was funded in part by the Research Foundation Flanders, which supports Igor Marchetti as postdoctoral research fellow (FWO14/PDO/115). Nilly Mor is support by the Israel Science Foundation (ISF 1519/13). The authors have no competing interests in this research. The authors thank Noa Avirbach, Tal Ganor, and Baruch Perlman for their assistance in the item development process. Igor Marchetti, Nilly Mor, Carlo Chiorri, and Ernst H. W. Koster declare that they have no conflict of interest. All procedures followed were in accordance with the ethical standards of the responsible committee on human experimentation (national and institutional). Informed consent was obtained from all individual subjects participating in the study. Instructions: Please respond to the following items by referring to the way you feel or think right now. For each item, please mark a vertical line on the horizontal line to indicate the degree to which you agree or disagree with the statement. 1. Right now, I am reflecting about my mood.